If you are in London and want to see a West End show, the best place to go for tickets is TKTS London in Leicester Square. It is operated by the Society of London Theatre, the industry body that represents London theatres, and is the only official theatre ticket booth so don't go to one of the copycats nearby. TKTS opened in 1980 as 'The Half-Price Ticket Booth'. It was a small wooden hut painted in green and yellow stripes which stood on the west side of Leicester Square. It moved to the Clocktower Building on the south side of Leicester Square in 1992 and was renamed 'TKTS' in 2001, adopting the name of its Broadway counterpart in New York. Nowadays, the ticket discounts can vary with some available at full-price and others at half-price or even larger discounts. They also have deals for interval drinks and souvenir programs so it's worth asking for all of the options on the shows you are interested in. Thankfully, TKTS is somewhere you can purchase tickets from with confidence. They offer a wide variety of London shows to choose from, both for on the day performances and up to a week in advance. It's best to check the shows available on the TKTS website, or at the booth itself where they put up new posters each morning and have electronic displays. You can't order online or over the phone so you do need to go to TKTS to buy tickets. Customers queue from about 9.30am (before it opens at 10 am) as that often means they can get the best seats for that day. Do note, the queue is not undercover so wet weather means getting wet. If you don't know what you want to see staff can also give advice. As well as the booths to take payment, they have staff who talk to customers in the queue who can help with what's still available, show timings, recommendations, and information about each show. Payment is accepted in-person at the booth only. They accept Visa, Mastercard, Sterling cash, and Theatre Tokens. Amex, bank and traveler's cheques, Switch/Maestro, and Solo are not accepted. Be flexible and always have more than one show in mind in case your first choice is sold out. And if you get to the front of the queue and all you wanted to see have sold out ask for recommendations on what's still available as you might find something wonderful you weren't expecting to see. There are some popular shows that TKTS never has discounted tickets to sell so check the list on the booth (there's always a poster with this regularly updated list). TKTS is a not-for-profit organization. By buying a ticket here you are supporting the West End theatre industry. Any profit generated from its operation is spent in promoting theatre and developing new audiences. TKTS does charge per-ticket booking fees, and the fees are always included in the advertised price. That means, the price you see listed is the price you will pay. So you know the discount you are getting it is OK to ask the face-value price for each ticket. Discounts can vary daily and during busier times so just because your friend got half-price tickets for Billy Elliott on a Wednesday evening in January it doesn't mean you'll find the same deals for a Saturday matinee in July. 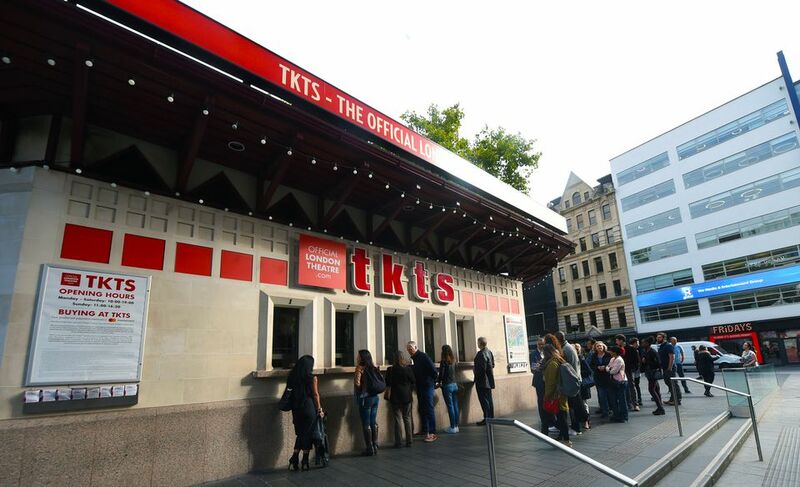 With over 30 years of experience, you can buy at TKTS with confidence from friendly, knowledgeable staff. Part of the fun is choosing what to see and there is no obligation to buy if you just want some advice. TKTS is on the south side of Leicester Square opposite the Radisson Blu Edwardian Hampshire hotel. The nearest tube station is Leicester Square. Use Journey Planner or the Citymapper app for directions to TKTS using public transport.